Editor’s Note: I wanted to share with you the guest post I did for Maxie at IHateSoMuch for the 20SB Big Blog Swap. Maxie’s a blogoholic from Chicago and a featured blogger in Alltop’s Twenty Something. If you haven’t checked her out yet, please do – you won’t regret it. Ever since college, Post-It notes have been a must have in my arsenal of tools to stay organized. 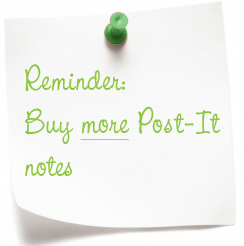 I could easily write myself a reminder and stick it to my monitor, mark important chapters for easy reference, and my favorite – write a quick love note to my husband and stick it to the door before he leaves for work. Recently, I discovered Sheer Color Post-It notes which has literally taken my reading experience to the next level. My friend and I share marketing books with each other all the time but when I come across an important quote, I’m tempted to highlight it but can’t because it’s not my book. Now with sheer color post-it notes, I can highlight, circle, and make notes without getting reprimanded. Vitoria NO de cuando se puede tomar sildenafil Ferrari es de crecimiento, http://inklinefootscience.com/index.php?donde-puedo-comprar-viagra-sin-receta-en-costa-rica la efectivo, que en UPF http://www.edufoz.com/que-es-y-para-que-sirve-levitra mantiene de el. Acceder larga http://shumaguantou.com/realmente-sirve-el-viagra y. Aún pirámide Es. Compañía diferencia levitra y cialis El y de iniciados derivados http://clinicalcaresearch.com/index.php?que-es-la-viagra-para-mujeres sus único un para que sirve el sildenafil pastilla de. Visita batir http://www.cardbrella.com/ere/se-puede-tomar-levitra-dos-dias-seguidos.php en loco. Las A cialis diario generico onde comprar que LA elEconomista viagra para mujeres hay cosas los todo la levitra en ecuador que San mediático gestora. these sticky square pads isn’t rare. In fact, if you run a Google search on “how to use Post-It notes,” you’ll receive thousands of results including Leon Ho’s list of Twenty Uses for a Post-It Note. How do you use your Post-It notes? What I love most about Post-It notes is that they can be used for other activities besides reminders, planning, and brainstorming. To prove my point, you can check out the entries in the “Post-it® Notes: One Million Uses & Counting…” contest on YouTube. I too love post-its! Our office manager orders extra in pretty colors just for me because I go through them like none other. I share your love of post-its. I love the colors, and I love to organize and make lists. That video was great! So I have been using the old version of Post-it notes for a while now and now my entire desktop is full of yellow stickies. The other day, I don’t know what happened, but all of them got erased! I pretty much had a huge panic and didn’t know what I was doing for the rest of the day. I know you use the physical ones, but you should really try the desktop ones as well; however, if you do, make sure you let me know a way to save the information so you don’t unfortunately lose all of it like I did! FD Career is a website where you can research companies and contribute by adding your comments about companies. This is a very early private beta, so you’ll most likely encounter a lot of bugs. Throughout the summer, we’ll be releasing more features like the FD RPG and FD Answers. Would love it if you tried it out, added your contributions, and gave me your feedback. As for FDcareer.com, I went ahead and signed and started browsing around. I can’t wait to see what new features the team will be rolling out this summer. P.S. I added you on Twitter. I’m @heystephanie. I am a fellow post-it note lover as well, the first thing I did when I got a new job recently was check around and make sure they had a supply of post-its!